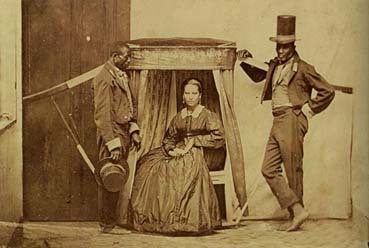 At the turn of the 20th century, a few years after the end of slavery, São Paulo grew, received immigrants, modernized itself and lived the benefits of a booming economy. The tale presented here approaches history from a different perspective to narrate a short period of time in the lives of three women of the Soares family – a white family who, unlike many others in the neighborhood, lost money with the end of slavery and couldn't change the old habits. Situated between a rich past in the coffee farm and a grim and uncertain future in the city after the abolition, the women cannot find their place in the metropolis. Gradually, they prefer isolation at home in the central area of town. There, Isabel, Ana and Maria surrender to sadness and longing for the “man of the house”, the father, who left them to return to work in the countryside. And, above all, they experience an impossible nostalgia, the nostalgia of slavery. The accumulation of all these feelings of inadequacy eventually leads one of the daughters to madness. The Dead uses this important moment of our history to think about several specific issues that still pervade social relations in Brazil, and also the structuring of our cities. The years that followed the end of slavery and the proclamation of the Republic were driven by very significant changes in the organization of Brazilian society, and in the current times of restructuring the contradictions of our country are still more evident. To look back at this particular time helps us to illuminate our understanding of the way Brazil is organized today – and in a city like São Paulo, the layers of history can be dug in every street, every building, on every story. Set in the final months of the nineteenth century and the very beginning of the twentieth, The Dead is the story of the decline of a family in São Paulo, narrated from the point of view of its three women: Isabel, the mother, and her daughters Maria and Ana. After the death of their maid Josefina – a former black slave back from the times when the family lived in the coffee farm – the notion of “home” seems to stop making sense. Isabel gets sick and does not get better. The doctor gives her a few months to live. Maria, a nun and teacher, has little time to devote to the house. She puts her sister Ana in charge. But Ana is a strange, quiet and lonely quiet girl who never was able to get married. As time goes by, Ana develops an obsessive relationship with the memories of the family farm and the slaves who lived there. Their ghosts come back to haunt her. Also, the three women miss Jorge, the father, who left them in the city to work for the Italians who purchased the old farm. The women know, deep down inside, that he will never return. The film is set around three big Brazilian holidays: Independence Day, Day of the Dead and Carnival. With few resources and unable to share the euphoria that comes with the modernization of the city of São Paulo, Isabel, Ana and Maria inexorably approach illness and madness. We are working on a visual type of representation for this film that is an important part of the project for us. Set in the late nineteenth century, the plot develops faithfully to that period, and all the characters are immersed in it. However, the streets and the city in which the characters walk around are the São Paulo of the current days. The internal spaces, the areas of privacy, are reconstituted as period sets – the same logic is applied to the costumes. But public spaces are the asphalt, buildings, wires and noise of the city we live in today. Through this clash of historical times, conveyed by a simple movie convention, the characters become kinds of ghosts: the past that still inhabits the city, and that is still the base element for what it has become. We seek to find partners for co-producion in Europe, and also present the project for distributors and world sales agents. São Paulo and small cities between São Paulo and Rio for the coffee farm scenes. Financing for development of the script from the São Paulo Culture Office. The total amount is R$ 70.000,00 (aprox. € 30.000,00).